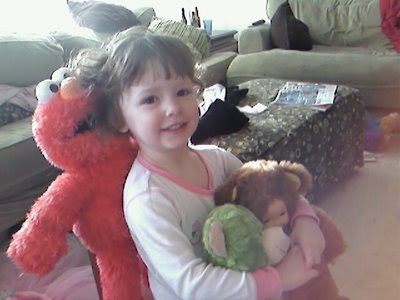 My niece is sick, and when Lucy heard this sad news, she decided that Bubsy would be cheered up by a "giant elmo, and green teddy bear and my furry baby" Here's the photo we just sent little Bubsy. My daughter thinks I am asking about right now, in the flesh, do I look pretty? So she sits there a moment, shuffles some things in her hands and says sweetly with a cocked head to the side, "Well, Mommy. Your hair is just a little bit wiggly." after seeing my balding head in this photo I actually took two (of the FOUR) vitamins I am supposed to take everyday. These are very fancy (read:expensive) vitamins that my mother bought for me. For the record.. .I actually just took my second set of two. This is the first time I have managed to get all four into my body in the same day. Of course I washed the second two down with a swill of beer. How's THAT for taking care of myself!